Volkswagen is taking iPhone compatibility to new level, with plans to unveil next week the iBeetle, a version of its iconic brand with a built-in docking station and specialized app. At the Shanghai Auto Show next week, Volkswagen will take the wraps off both the iBeetle and the iBeetle Convertible. The two models are scheduled to launch at the beginning of 2014 (via iLounge). The cars will be the first from the Volkswagen group to feature the iPhone as an integrated component. Future Volkswagen iPhone compatibility will be accomplished through two means: as an app and through the iBeetle's built-in docking station. Plugging an iPhone into the docking station will allow users to take advantage of most of the features of the handset. Users will be able to use the iPhone to navigate, to make hands-free calls, listen to music, and more. The Beetle app allows the iPhone to connect to the Beetle either with a docking station or wirelessly. Users can play tunes through Spotify and iTunes, have Facebook and iPhone message read aloud through the car's speakers, share their location as a digital postcard, and share photos taken within the car to social network. The app also gives the option to display vital stats of the Beetle, including a G-meter measuring lateral acceleration, oil and coolant temperature gauges for the engine, a chronometer, and a compass. 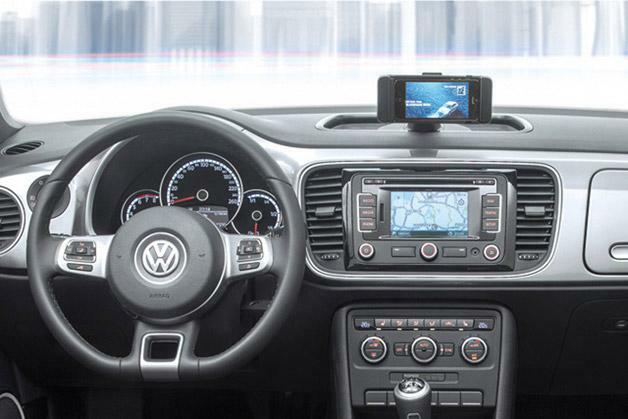 Volkswagen has not specified which models of iPhone the iBeetle dock will be compatible with. Including a built-in dock takes iPhone-integration a step further than most other automakers. While they may not be building in docks, a number of other major automakers are rolling out integration with Apple's "Eyes Free" Siri feature, allowing users to interact with their devices without taking their attention from the road. Earlier this year, Chevrolet became the first to debut models with Siri integration, rolling out its Sonic and Spark.